Athens is steaming in August, so it’s a pity to lose even one moment of the evening cool. That’s why you see Athenians loitering nightly in outdoor cafes, tavernas, rooftop gardens and cinemas… cinemas? Yes! 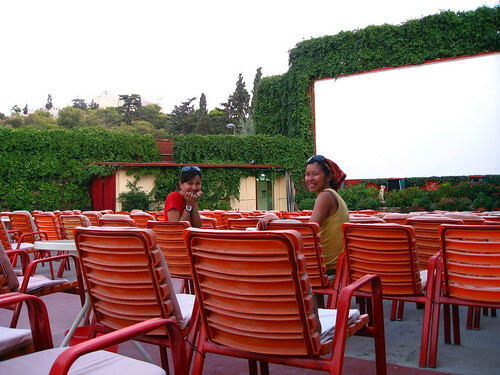 Come summertime, Athenians watch their movies in the fresh night air with a big, cold beer and a bigger box of popcorn. If you’re here from June to September, seeing a film in one of the classic outdoor cinemas is a romantic way to experience the familiar in a something new, something different sort of way. The four places I’ve listed here are all well positioned, have some interesting auxiliary features like shops or eateries and are in animated areas after dark. Some of the older ones have not stayed current with sound and screen technology, so if you’re picky on those subjects, choose an old cult classic or something you’ve seen a gadjillion times, get a drink and enjoy the ambience. Cine Paris in Philomousou Etairia Square, the main square of Plaka, has an outstanding view of the Acropolis, routinely plays old movies that hit a chord of nostalgia for most film lovers, and has the bonus feature of racks upon racks of vintage movie posters as distributed in Greece. A Reservoir Dogs poster in Greek is not your average Athens souvenir. Cine Psirri is connected to a restaurant that serves tasty plates of modern Greek cuisine. After the movie the neighborhood of Psirri is just getting going. Do as the bohemian locals do and live for the moment. The night is young. Cine Flisvos, in Flisvos Marina, has a sea breeze, less congestion, an outstanding souvlaki joint and playground just outside of the cinema. It plays mostly current runs, many of which are Hollywood films shown with Greek subtitles. See Flisvos Park as featured in July’s Photo Friday. Aigli Village Cool just on the edge of the National Gardens makes for a leafy green place to enjoy an outdoor movie. Before the show, sit at the adjoined Lalabai cafe and have a coffee or glass of wine. After the film you can walk through the garden by moonlight to the National Palace and wait for the hour to change, the National Guard along with it. Every hour on the hour!